Americans and Brits are more concerned with the uncertainty of populism and Brexit than Syrians and Burmese are with the ongoing civil war and military crises happening within their borders. The US and the UK are two countries known for their seemingly unshakeable political and economic stability, but this stability does not equate to the lived citizen experiences of growing pessimism in these and many other developed countries. Brexit and rising populism are the main events disrupting stability in more peaceful countries, giving way to increasingly pessimistic perceptions on the future of peace and security. On the other hand, citizens in poor and extremely unstable countries project the highest levels of optimism. 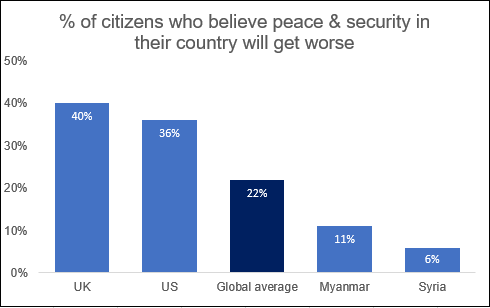 In Syria and Myanmar, two of the most unstable and precarious countries in 2018, citizens are confident that the status of peace and security will improve. The Pessimism Index data comes from the Peace Perceptions Poll (PPP), the largest study of its kind, highlighting the views and voices of over 100,000 citizens from around the world. The PPP, a partnership between RIWI Corp., International Alert, and the British Council was conducted in 15 countries, in June 2018. More information on the PPP including the full 15-country Pessimism Index can be found here.